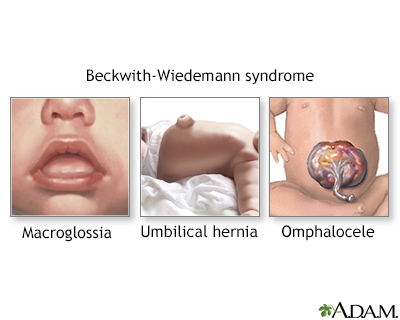 Beckwith-Wiedemann syndrome is an inherited growth disorder. Babies with this syndrome may have a range of symptoms. These symptoms may include large tongue (macroglossia), large organs (visceromegaly), large body size (macrosomia), abdominal wall defects (umbilical hernia or omphalocele), and overgrowth on one side of the body (hemihyperplasia/hemihypertrophy). Reviewed By: Jennifer M. Kalish, MD, PhD, Attending Physician, Division of Human Genetics, The Children’s Hospital of Philadelphia and the Perelman School of Medicine at the University of Pennsylvania, Philadelphia, PA. Also reviewed by David Zieve, MD, MHA, Isla Ogilvie, PhD, and the A.D.A.M. Editorial team.